Motoric cognitive syndrome is a newly described pre-dementia syndrome characterized by slow gait and cognitive complaints. Motoric Cognitive Risk Syndrome or MCR is a clinical approach to identify older adults who are at risk of converting to dementia. However, being diagnosed with MCR does not automatically mean that one has dementia but is indicative of being well on the way towards it. Motoric cognitive risk (MCR) syndrome is a fairly new â€˜predementia assessment.â€™ It is characterized by cognitive complaints such as slow gait that are simple and easy to identify and assess in older adults. In all, there are four subtypes of MCR defined by substituting slow gait with short stride length (MCRs1), slow swing time (MCRsW), high stride length variability (MCRslv) and high swing time variability (MCRswv). MCR subtypes are not mutually exclusive. Geriatrics professor Joe Verghese involved thousands of older people from 17 different countries and after assessment published his report on the prevalence of motoric cognitive risk syndrome, newly characterized by slow walking and cognitive complaints, in several countries of the world. He also studied its association with dementia risk in the journal Neurology. Indeed a simple test that measures how fast people walk and whether they have any cognitive issues can determine how likely they are to develop dementia, which can cause Alzheimerâ€™s within 12 years â€“ scientists at the Albert Einstein College of Medicine of Yeshiva University and Montefiore Medical Center opine. Age: Risk goes up with advanced age. Alcohol use: Alcohol abuse increases the risk of dementia while drinking a moderated amount may be protective. Atherosclerosis: The accumulation of fats and cholesterol in the lining of arteries coupled with inflammatory process leads to thickening of the vessels which can hinder blood flow to the brain. This can lead to stroke or other brain injury. Bad cholesterol can raise the risk for vascular dementia. Diabetes: Those with diabetes appear to have higher risk for dementia although the evidence for this association is modest. Poorly controlled diabetes is a well â€“ proven risk factor for stroke and cardiovascular disease-related events – which in turn increase the risk for vascular dementia. Down syndrome: Many develop early-onset AD with signs of dementia by the time they reach middle age. Genetics: Likelihood of developing genetically linked form of dementia increases when more than one family member has the disorder. Sometimes, when one parent carries a mutation, it increases the risk of inheriting the condition. Genetic mutations may underlie dementia in specific populations. A mutation of the gene TREM2 found common among people with a form of early onset frontotemporal dementia runs in Turkish families. Hypertension or high blood pressure is linked to cognitive decline, stroke, and types of dementia that affect the white matter regions of the brain. Mental illness: Depression has been associated with mild mental impairment and cognitive function decline. Smoking: Smokers are prone to diseases that slow or stop blood from getting to the brain. 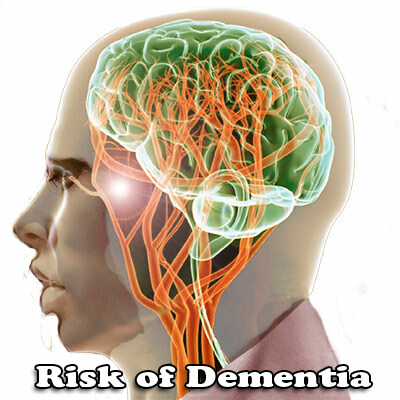 Age remains the strongest risk factor for dementia, particularly for Alzheimer’s disease. The incidence of AD doubles every 10 years after the age of 60. A number of studies have found that dementia incidence continues to increase with age after 85 years. Identifying the early risk factors for dementia could help ward off the crippling disease, according to researchers from Albert Einstein College of Medicine and Montefiore Medical Center. Those with MCR can ward off their risk of dementia by eating right, exercising, maintaining healthy weight and engaging the brain in activity. Healthy people can also ward off dementia in much the same way. Talking of identified potentially modifiable risk factors associated with MCR, research reveals that obesity was associated with 39% greater risk for slow gait and cognitive complaint and sedentary lifestyle was associated with 79% increase risk. The simple strategy of asking older patients if they have memory complaints and timing their walking over 8 and 10 seconds could help predict their risk for developing dementia. A walking speed slower than 1m per second which is about 2.2 miles per hour is considered slow gait and less than 0.6 m per second is considered abnormal. As spinal fluid, imaging, bio markers and other tools for diagnosing cognitive decline are good but not very actionable for many clinicians, these simple tools as outlined above can help identify people at risk for dementia.